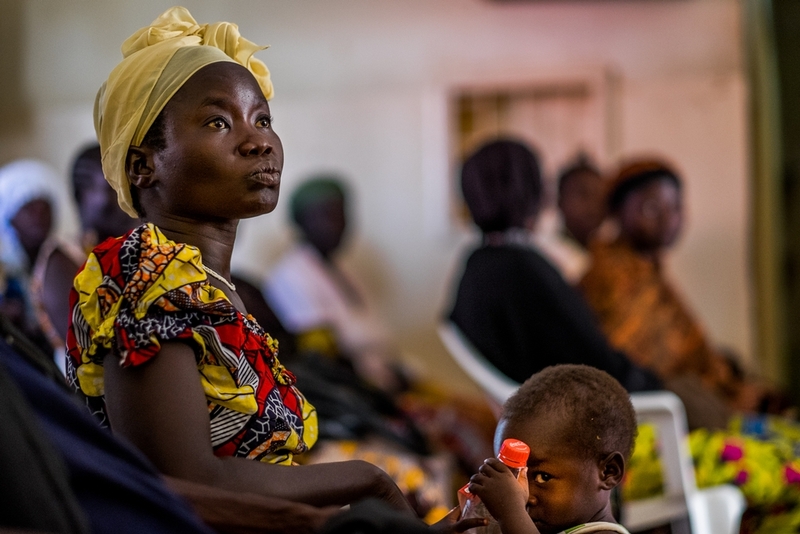 In Uganda, MSF focuses on responding to the medical needs of refugees and improving access to care for HIV, tuberculosis (TB) and sexual and reproductive health. Uganda was notorious for its human rights abuses in the days of Idi Amin and Milton Obote’s rule in the 1970s and 1980s. But today, the landlocked East African country of roughly 41 million people has managed to emerge from a disastrous civil war and economic catastrophe to become relatively peaceful, prosperous and stable. The country has won praise for its vigorous campaign against HIV/AIDS. This has helped to reduce the prevalence of the virus – which reached 30 percent of the population in the 1990s – to single-digit figures. Médecins Sans Frontières/Doctors Without Borders (MSF) first worked in the country in 1986. Huge numbers of refugees from the southern belt of South Sudan (Greater Equatoria region) continued to arrive in Uganda in 2017. By August, one million people – 85 per cent of whom were women and children – had fled across the border into northern Uganda, according to UNHCR, the United Nations refugee agency. Despite the efforts of the Ugandan authorities and other organisations, the provision of aid was insufficient to meet the urgent needs of so many people. MSF developed and adapted a wide range of activities to assist refugees. 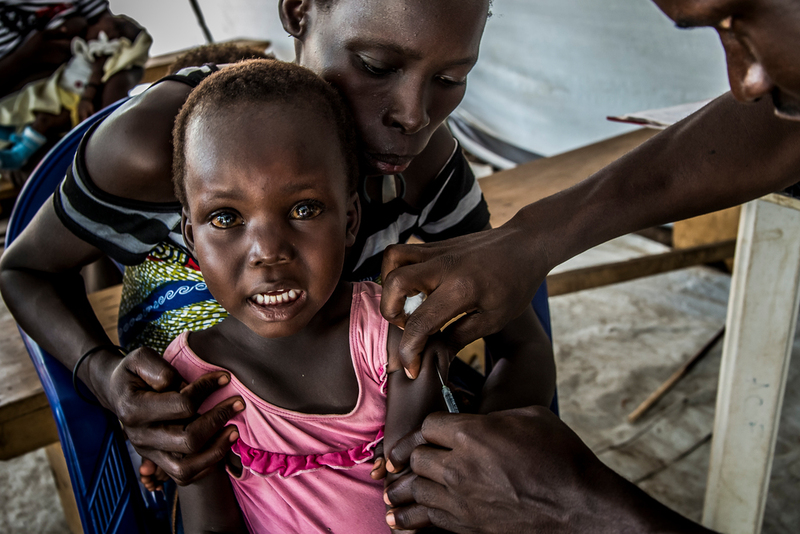 In Bidi Bidi, Imvepi, Palorinya and Rhino settlements in Yumbe district, teams conducted 273,773 primary healthcare consultations, admitted 3,574 patients to MSF-managed facilities, assisted 712 births, and offered mental health support and care for 786 victims of sexual violence. Outpatient Department of the MSF heath center in the Imvepi refugee camp. In addition, staff provided vaccinations and ran health surveillance activities. The logistics team worked to improve access to drinking water, supplying an average of two million litres of water per day at the peak of activities. An estimated 1.2 million people live with HIV in Uganda. Despite significant improvements, HIV detection and care remain a public health concern in specific groups of people, such as fishing communities, children and adolescents. In landing sites for fishermen on lakes Edward and George, MSF opened a project in 2015 to improve access to HIV and TB testing and treatment. MSF offers quick and reliable viral load monitoring through its point-of-care testing facility at Arua regional referral hospital, allowing patients to be switched to second-line antiretroviral (ARV) treatment if necessary. By the end of 2017, 739 people were on second-line ARVs in Arua. In 2017, the team also provided drug-resistance tests and drugs which enabled 10 new patients to access third-line treatment. MSF reinforced clinical and psychosocial support for HIV patients in 2017, especially for adolescents, to help them adhere to their life-long treatment. Adolescents are particularly vulnerable to the life-threatening health risks related to unwanted pregnancies, HIV/AIDS and sexually transmitted infections, due to a lack of awareness about these risks, and the shortage of youth-friendly sexual health and counselling services. MSF opened the Kasese adolescent centre in Kasese town in 2015, which offers sexual and reproductive healthcare, as well as community awareness-raising and recreational activities that encourage adolescents to come for a consultation. In 2017, 30,852 adolescents had consultations and 20 victims of sexual violence received care. 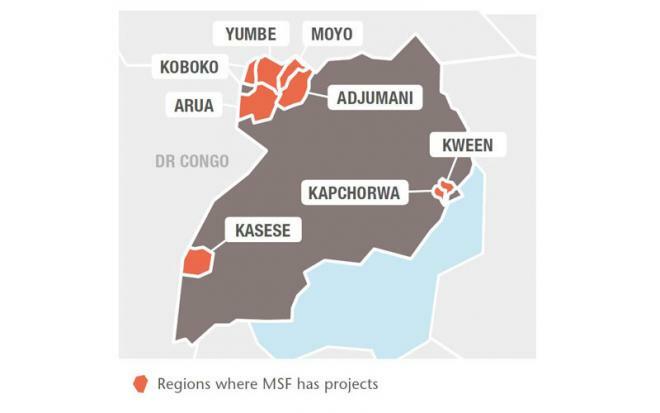 Between the end of October and the beginning of December, MSF responded to an outbreak of Marburg fever in Kween and Kapchorwa districts, in the east of Uganda. Teams set up two 10-bed treatment centres, trained healthcare staff and assisted local health authorities with epidemiological surveillance, community health promotion and mapping activities.